Want to listen to great classic jazz, but forgot to bring the radio or do not have solid reception? There is an app for that. As mentioned on "The Jazz Lover," listeners can download the TuneIn Radio program for their smartphones and mobile devices. The standard TuneIn Radio app (not the Pro version) can be downloaded for free of charge. It is available on a wide range of devices including Apple iOS (iPhone, iPod Touch, and iPad), Android phones and tablets, Windows Phone, Chromecast, and more. To download the TuneIn Radio application, simply go to the marketplace and search for "TuneIn Radio." Once the search is over, click the icon and touch the "Download" button. After it is downloaded and installed, press the app to begin. Once TuneIn Radio is running, listening to U92 online is easy. 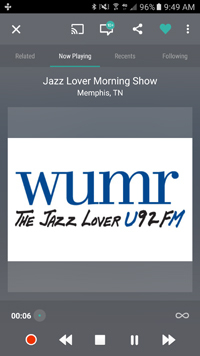 Either search for "WUMR" in the search bar or go to the "Local Radio" tab on the home screen. Once the U92 webstream, is buffered and loaded, listeners will hear the same great programming (with the exception of sports games) currently airing on FM radio. Aside from WUMR, TuneIn Radio offers over 50,000 radio stations around the world and more than 120,000 programs can be heard directly on mobile devices and PC at TuneIn's website. However, keep in mind internet usage. Unless your phone plan has unlimited data or using WiFi, data charges from your cellular phone service will apply. Tune into U92 online 24/7!